The McKendree Review is proud to present the first segment of an ongoing project featuring different departments of McKendree University. Whether students are new, transfers or thinking about changing majors, there are always students who are searching for career paths. Because the McKendree Review reaches out to staff, faculty, alumni, current students, prospective students and parents of current, prospective or graduated students, we hope to provide a helpful outlook on the different majors McKendree offers with our new project: Department 101. As the first segment of the project, the McKendree Review would like to introduce our audience to two areas of the Humanities Department: English and Writing. As an English major with an emphasis on literature and writing, I feel it is important to showcase the English and Writing departments of McKendree University because there are people out there who do not take the English and/or writing fields seriously. Some think teaching is the only English profession that exists; others believe the English and writing fields are the easiest fields to study. For anyone who wishes to be an English major or minor, let me make something clear: the material will make you want to rip your hair out at times, scream at your textbooks or even make you crumple up three-thousand sheets of loose leaf paper. But, despite the headache-worthy knowledge in which some of the classes hammer into your heads, the tough journey is worth it. The study of literature and writing will enrich your minds with worldly knowledge. You will gain an appreciation for material written in the 1500s, 1600s, 1700s, 1800s, 1900s and present day. You will learn to read and understand Shakespeare. You will gain a general knowledge regarding semantics and syntax. You will be able to learn about historical periods through literary works such as Native Son (Wright), The Sound and the Fury (Faulkner) and Persepolis (Satrapi). Alongside the literature, you will also improve your writing skills in areas like specificity, clarity and organization. Some writing intensive classes are designed to teach you different aspects of writing such as professional writing and academic writing. Granted, the content for several English and writing classes is not easy and requires an immense amount of time dedicated to studying, but the enrichment of knowledge, insight and critical analysis is worth the struggle. One of the tracks the English field offers is Secondary Education of English. Although the education route did not pan out for me due to personal reasons, Megan Doty, a Secondary English Education major, has completed mostly all of the English and Education classes in which her degree offers and will be graduating in December to start the next chapter of her life. Doty praised the English department at McKendree when I asked her what her thoughts were regarding the education aspect of her degree and added, “[The department] could not do a more fantastic job at preparing future English teachers. They not only offer classes specifically geared towards helping all of us plan interactive and creative lesson plans, but they also provide excellent examples of caring, dedicated teachers. They also open our eyes to some of the stresses and hard realizations that will come along with teaching and provide practical ways to combat those stresses. In order to explain the benefits of the English field even further, I have created a piktochart that briefly covers the main aspects of the English department. As you can see from the piktochart, the English Department offers fun organizations in which any student can join. I have had the pleasure of being a part of the Literary Interest Society (LIS), the McKendree Review and the Creative Writing Group for the past few years, and I cannot wait until we all meet up again for another fun year. My favorite part of LIS is the Chicago trip because it gives students a chance to experience life inside a big city (sorry, but St. Louis hardly counts) as well as explore a part of Illinois that may be foreign to them. I have always lived in smaller cities like O’Fallon, Ill. or Ft. Walton Beach, Fla. Going to Chicago for the first time two years ago was certainly a culture shock to me. Walking in the streets of Chicago gave me a chance to live on the edge a little; the streets are covered with taxis and pedestrians, and if you are not careful, well…, let us not go there, shall we? Obviously, if it was not for the McKendree Review, you would not be reading any of these articles right now. When I first joined the Review, I never pictured myself as Editor-in-Chief. In all actuality, the only reason I signed up for the Review during my first year of college was because I was looking for information for McKendree’s anime club. Yes. Guilty as charged. Then, when I received an email regarding interest for the Review, I decided to give it a go. It turns out I was pretty good at writing film and book reviews, and before joining the McKendree Review, I have never written an article for a school newspaper in my life. Joining the McKendree Review showed me how much I love editing, and my decision pretty much told me what I wanted to do after college: editing and publishing. That example just proves that something small can take you somewhere incredible! One of my favorite parts of the week is when I go to McKendree’s Creative Writing Group meeting. Do not worry, the name will be changed into something much cooler early in the semester. No matter what your major or minor is, the CWG welcomes anyone who loves creative writing. Whether you love writing poetry or short stories, the CWG is the place to be. Once a week, a student will volunteer his or her creative work(s) for the group to read and workshop. Some members give advice on content. Others focus on editing. The volunteer will receive an abundant amount of advice from different people to help them improve their writing. Unfortunately, the Creative Writing Group is not offered as a registered organization, but it will make an informal presence at the Involvement Fair. In fact, the sign-up sheets can be found at the Review’s booth and possibly, the LIS’s booth. If you are interested, we are planning on meeting Fridays (starting the Sept. 5) at noon to 1:50 PM in the Writing Center lounge. If you are either planning on going into English or are already a part of the English discipline, you will have a chance to be nominated for Sigma Tau Delta (∑Т∆), the International English Honors Society. ∑Т∆ has an induction ceremony at the end of each semester where eligible English majors are inducted into the society. One of the benefits of being part of Sigma Tau Delta is the scholarship opportunities. Members receive a monthly newsletter regarding what’s new with ∑Т∆ and are encouraged by professors to apply for the scholarship opportunities. Even though I am majoring in English with an emphasis on literature and writing, I am not an avid reader. The main reason I decided to go into English is because of my love for writing and editing. At the time, there was not a field solely dedicated to writing, but starting this year, McKendree University is welcoming a new program to the Division of Humanities: Professional Writing & Rhetoric (PWR). Emily Lucia, senior, is one of the first students entering into the PWR major, and she wanted to share with others why she is thrilled to start her new degree. 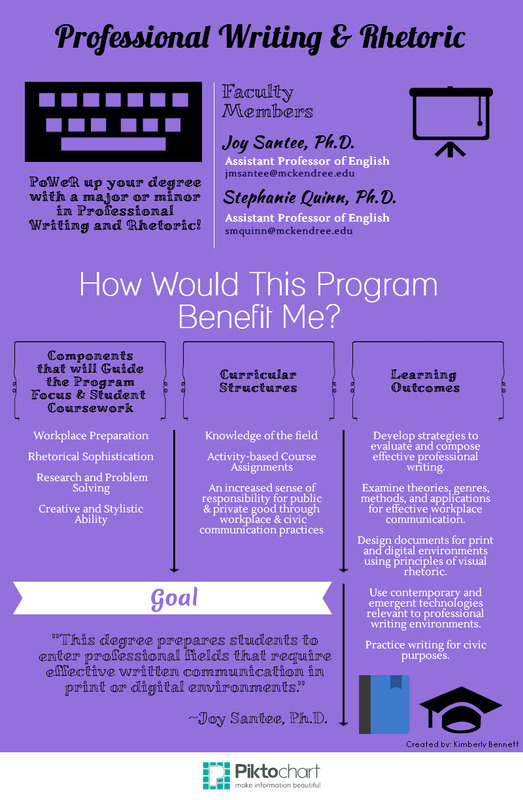 Here is another piktochart that will help cover the basic information regarding the new Professional Writing and Rhetoric course. For more detailed information regarding career paths, visit the English department’s information page: What Can I Do with an English Degree? Or, make an appointment with McKendree University’s very own Career Services. Here is a list of classes both the English and PWR departments offer. You can find their descriptions within your student catalog. Note that some of the classes can be offered for more than one track. Thank you for taking your time to read the Review’s first Department 101 article, showcasing the English and writing divisions of McKendree. As of right now, the next department / division has not been determined, but we will contact the department chair within the upcoming weeks. So, faculty and staff, be on the lookout for an email from the McKendree Review! The poll closes on Friday, Sept. 05 at 6 PM. Please let us know if you would be interested in writing your own Department 101 piece for your program / major / minor / department / division.